I’m one who, to my wife’s chagrin and mortification, sometimes speaks first then thinks later about what I just said. The fuse between my mouth and vocal chords burns short and quick, while the fuse between my mouth and brain smolders like wet rope. I wear a size eight shoe. But it’s my size 13 mouth that gets me into trouble…like a goofball friend who makes a dare. 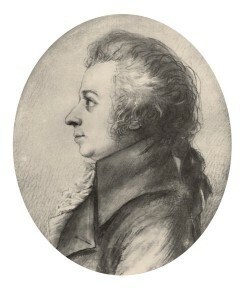 Mozart’s quote is prophetic and one I try to be mindful of every day—not to be too much of a wise-guy. A closed mouth gathers no feet. 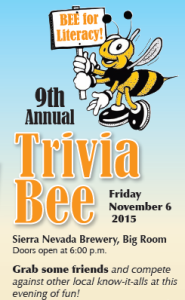 On Friday November 6, 2015 I’ll put my brain to test at the Butte County 9th Annual Trivia Bee, an event to be held in the Sierra Nevada Brewery’s Big Room in downtown Chico. I’m honored to co-emcee the program which features teams of know-it-alls pining for championship medals and the bragging rights that go with them. Jocularity aside, the event has a special purpose. The Butte County Trivia Bee promotes literacy awareness and raises funds to support Butte County Literary Services. Funds raised will provide learning materials, resources, and help adults and children in our community improve their basic reading and writing skills. The Trivia Bee begins at 6 PM and features a silent auction and raffle. Teams of three will then compete against other trios of smarty-pants over the course of three rounds. If there’s a tie we’ll run a Sudden Death tie-breaker. Coordinate your own team or come out and support this wonderful cause. The event is devoted to help others less fortunate than the rest of us…people incapable of reading this post. Not because they don’t own a computer, but because they can’t read. Join us for an evening of breezy competition, laughs, and playful fun. For more information contact triviabeeforliteracy@gmail.com. A rising tide lifts all boats. Let’s raise the tide of literacy.